Homemade ketchup (or is it homemade catsup?) makes everything taste so much better. 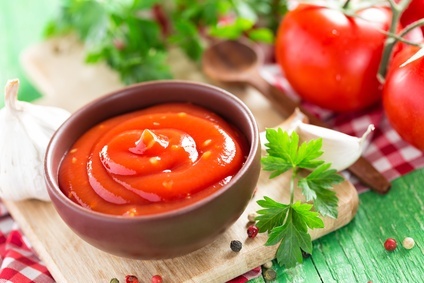 Following are some excellent homemade recipes for ketchup. Use fresh tomatoes if you can, it's so much better. Homemade ketchup takes a little time to make, but the end results are well worth the effort. You cannot go to the grocery store and buy ketchup that tastes as good as this does. No chemicals or preservatives. The best part of making your own ketchup? No high fructose corn syrup and all the other preservatives that are added. You may also modify the recipes to suit your own taste. Make it sweeter, spicier - it's up to you. Are you ready? In a large stock pot add the tomatoes and then the vinegar, kosher salt, mustard, spices and red pepper. Stir well to combine. Bring to a boil and simmer until thick. Add the sugars 30 minutes before you seal the ketchup into jars. PREHEAT the oven to 350 degrees and you will need a baking sheet lightly sprayed with vegetable oil. Toss the tomatoes with 1 TBS of olive oil in a large resealable bag. Place on the baking sheet and roast for 15 minutes, or until soft. Place the roasted tomatoes in a blender or food processor and blend until smooth. Press the solids with a spoon and strain well to extract as much liquid as possible. Heat a large saucepan on medium-high and add the other tablespoon of olive oil. Saute the onion and garlic until translucent. Add the remaining ingredients and season to taste with salt and pepper. Combine ingredients in a saucepan over medium heat; whisk until smooth. Bring to a boil, reduce heat and simmer for 20 minutes, stirring often. Remove from heat and cover until cool. Chill in a covered container. Makes 1-1/2 cups. Heat the oil over medium-high heat in a large saucepan. Add the onion and red bell peppers and saute for 5 minutes. Next add the tomatoes and garlic and cook for 30 minutes or until vegetables are very soft. Add the brown sugar and vinegar and simmer on low for another 30 minutes. Take off the heat and pour into a blender or food processor with the chipolte peppers. Blend until smooth and pour back into the saucepan and simmer another 30 minutes or until thick. Cool and store in a glass container in the refrigerator. Remove the pulp from the mango and place in a blender along with the remaining ingredients. Pulse until creamy and pour into a saucepan. Over low heat cook for 1 hour until it is thickened. Remove from the heat and cool. Strain through a fine sieve and refrigerate 24 hours before serving. This is a wonderful homemade ketchup. If you want it hotter, go for it. In a large stock pot, combine the tomatoes and onion and cook until tender. Pour into a blender or food processor and process until smooth. Return the mixture back to the stock pot and simmer until reduced in half. In a small bag, put the whole cloves, mustard seed, celery seed together. Break the cinnamon stick in half (or quartered) and add to the bag and tie. Add the remaining ingredients and continue cooking, uncovered, until it reaches the desired consistency; or approximately 4 hours.